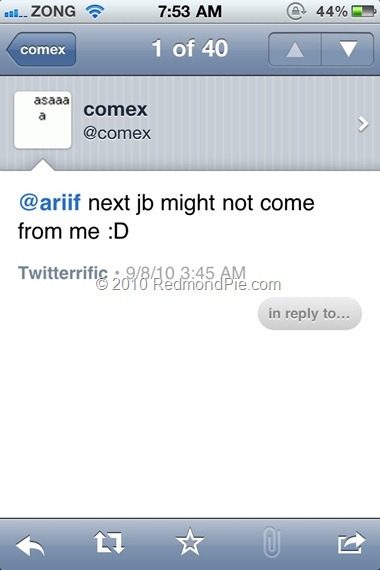 Comex Not Working on iOS 4.1 Jailbreak? Well well.. it was only a few days ago when MuscleNerd of iPhone Dev-Team confirmed that Comex will try and jailbreak iOS 4.1 using another userland exploit, if not then we will have to wait for a low-level bootrom exploit which may take longer to release. And now, while replying to a Twitter user, Comex has confirmed that the next iOS 4.x jailbreak may not come from him. So there you go! Of course this doesn’t mean that Comex is leaving the jailbreak scene like Geohot, it is just that the next jailbreak “might” not come from him. But there is something about his tweet (notice the smiley at the end) which makes me believe that he may not be all that serious about what he just said.